Asking for a raise at work can be awkward — even if you're on the right track and feel confident in your abilities. But many workers don't even attempt to ask for higher pay. Too many: About 57% of workers in a PayScale salary survey said they haven't asked for a raise, citing discomfort talking money, fear of being viewed as aggressive, and concern they'd lose their job. That's a shame: 75% of employees who requested a raise got one, according to PayScale. In fact, if you don't ask for a raise, you could miss out earning between $1 million and $1.5 million over the course of your career, Linda Babcock of Carnegie Mellon University estimated to NPR. That is a lot of cash — which could otherwise help you build a comfortable retirement nest egg. Now, one vital step before you negotiate is preparation: "Doing your homework and building a relationship with your boss is important before salary negotiation," Heather Krasna, director of career services at Columbia University School of Public Health, said. "Ask what you can do to contribute, always be willing to help and track your accomplishments." Indeed, success will be just as much about what you don't say as what you do. 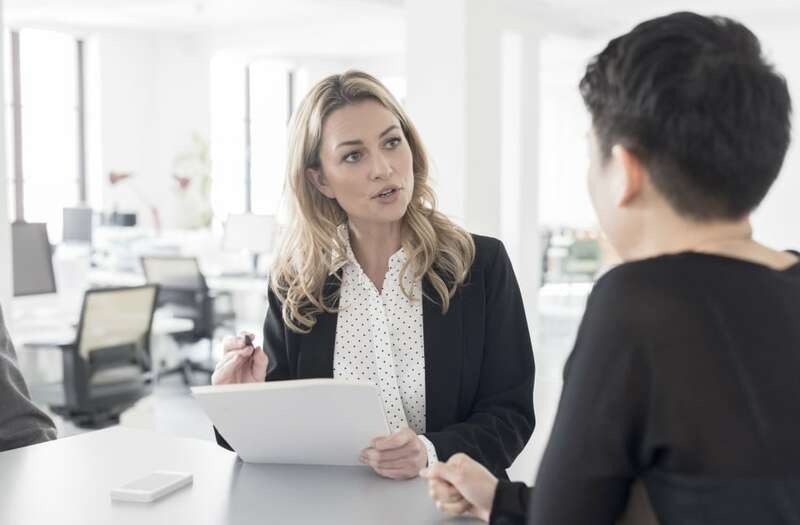 In a salary negotiation, there are a few words or phrases that could derail your efforts — and should be avoided at all costs. Here are 10 phrases that could make salary negotiations crash and burn. The negotiation process is a back and forth conversation where both parties arrive at a mutual agreement on salary. You could be leaving a lot of money on the table if you say "yes" to the very first number your boss offers. "Even if you are thrilled with the offer, resist the urge to accept it on the spot," Krasna said. "Ask for a few days to think about it, so you have time to digest and research the entire offer." Doing some digging could also help you prepare a counteroffer: You might discover you actually deserve more money, based on what others in your field and position are earning. You should know why you want or deserve a raise, because the boss will ask for a basis for the pay increase or promotion. You won't get far if you say you don't know or give some lame reason like, "It's time" or "I work hard." "It's imperative you do your homework ahead of time," Krasna said. "This includes comparing the tasks you handle in your current position and how they relate to similar jobs in your industry." Come with receipts: "If you are doing more than what is in your job description, those added responsibilities will give you leverage," Krasna said. A tantrum at work isn't going to help you get more cash, and giving your boss an ultimatum could send you into time out. Indeed, most bosses will respond to a threat to leave — if you don't get what you want — by showing you the door, Krasna said. "Your behavior ultimately sets the tone for the meeting," Vicki Salemi, career expert at Monster said. "You never want to use a threatening tone or language. Always keep your words even-keeled and positive." "I could get more from..."
Again, you risk having your employer show you the exit if you tell them someone better is begging for your attention: "I'm not a fan of bidding wars," Krasna says. "Bringing an offer from another company to the negotiation may break the trust bond with your boss." Of course, if you have multiple offers (and a strong relationship with your employer) you might let your windfall be known, especially if you present it as simple information that builds a case for a raise — not a threat, Salemi said. "This completely depends upon the trust and relationship you have with your boss... you can be honest and say other companies are reaching out to you and [ask] how does your current company see your future?" Are you really sorry you are asking for money or do you think "saying sorry" might cushion the blow of asking for a raise? "Never apologize for asking for more money," Salemi said. "They aren't going to say they are sorry for offering you a raise so there is no reason for you to apologize for asking." "I need you to pay me..."
Demanding a specific amount of money is not negotiating; instead it's taking your boss hostage and making you look desperate. "In the spirit of negotiation, an abrasive or needy tone will get you nowhere," Salemi said. "Instead, ask open-ended questions about the pay range you have in mind, saying you've done the due diligence and ask for your boss' thoughts about the research you've presented." Thursday afternoon is the best day of the week to negotiate your salary, Ryan Kahn founder of The Hired Group, star of MTV'sHired and author of How To Get Hired and Hired! The Guide for the Recent Grad said. "Hiring managers are tying up loose ends on Friday so they want to close out the week's business and come in fresh Monday morning," he explained. "If you approach negotiations on a Thursday afternoon, the hiring manager will be more motivated to get the deal done before the weekend, which improves your chances of getting the number you want." Gossiping about salary negotiations — or bringing in what you "heard" others are making — will only get you in hot water and destroy any further movement. Anything said during the confines of negotiation should remain in that space, Salemi said. "Office gossip about salary negotiation is never OK, especially if you consider some of the information discussed could be confidential," she said. While you can absolutely bring up average salaries for workers in your position or industry, it's best to leave out rumors or information a coworker shared with you privately. You may have a certain comfort level with email, but email is not a dynamic medium and gives your boss too many easy opportunities to say no to a raise. "Always conduct salary negotiations in person or at least over the phone if you work remotely," Salemi said. "This provides an open dialogue... and allows you to get a better sense of each other's tone, which can be lost over email." Aside from sounding arrogant, asking for far more money than is reasonable could limit your chances of getting a raise. Of course, asking for too little could also make your employer wonder if you are worth any raise at all. "I like to use the 15% rule," Kahn said. "Once you receive the offer and you've taken a little time to think about it, tack on 15% to the offer. A 15% increase won't insult the manager, but could possibly give you a few thousand extra dollars during final negotiations."